Ahly are hoping for a complete recovery from their poor start in the CAF Champions League when they face Township Rollers of Botswana in the fourth round of the tournament's group stage at Botswana National Stadium on Saturday. "I know the importance of the game against Township Rollers in the fourth round, especially after the draw against Esperance and the loss to Kampala in the first two rounds of the group-stage," Ahly's new coach Patrice Carteron said at the pre-match press conference. Last week, the Cairo giants claimed their first win the group stage with a convincing 3-0 victory in Alexandria over Township Rollers. Carteron said he believes that the Red Devils will make use of the win to qualify for the quarter-finals. "Beating Township Rollers in the third round will motivate the players to do their best during Saturday's game to qualify to the quarterfinals." Veteran midfielder Ahmed Fathi will miss the game due to muscle injury. Fathi is completing a rehabilitation programme for a groin strain. Ahly's Moroccan striker Walid Azaro is also a major doubt for the game, after suffering from a minor injury during Thursday's training session, and he will undergo medical tests to determine his status. 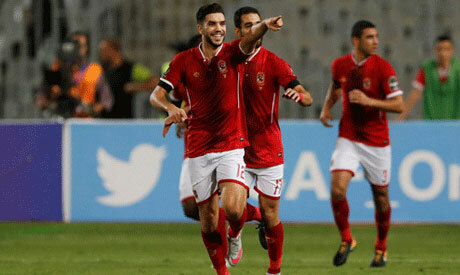 Ahly claimed only one point from their two first group stage matches with goalless draw with Tunisia's Esperance and suffering a shock 2-0 loss at Uganda's Kampala City, before beating Township Rollers in the third round. Ahly, who claimed only one point from their opening two games in Group A of the Champions League, are now second in the teams' ranking with four points, three behind leaders Esperance. Kampala and Township Rollers have three points each.